Selections from Library Journal’s list of the Best Business Books of 2010, with annotations edited by Meg Trauner, Ford Library Director. You can also download the full listing as an annotated PDF here. Bennis, Warren with Patricia Ward Biederman. Still Surprised: A Memoir of a Life in Leadership. Recounts Bennis’s early experiences as a World War II soldier and Antioch College student, as well as stories from his academic career with notable colleagues including Doug McGregor, Erik Erikson, Werner Erhard, and Tom Peters. Carey, David & John E. Morris. King of Capital: The Remarkable Rise, Fall, and Rise Again of Steve Schwarzman and Blackstone. Presents the world of private equity and buyouts by focusing on the Blackstone firm and its principal, Steve Schwarzman. Also available as an audiobook. Gwartney, James D. & others. Common Sense Economics: What Everyone Should Know About Wealth and Prosperity. Explains basic economic ideas and theories, and discusses the interplay of politics and economics, while making suggestions for practicing personal financial responsibility. Johnson, Simon & James Kwak. 13 Bankers: The Wall Street Takeover and the Next Financial Meltdown. Explores the historical background in the Founding Fathers’ debate on banking and financial institutions and assert that the bailouts of America’s largest banks have made them bigger, more powerful, and more dangerous. Read our full review here. Last month I posted on the language program Byki, this month I’d like to highlight ISI Emerging Markets, a database that covers the world’s most dynamic economies. Several times a year, Fuqua students study about and travel to locations such as China, South Africa, and India. On these trips, they tour major companies which allows them to witness how business is conducted, products are made, and strategies are planned. One of the resources I point them to when they’re planning their visit is ISI Emerging Markets, a database covering more than 30 countries. Pulling their content from current economic data, company and industry information, news both in English and non-English, and financial market reports, this source is a one stop shop for much of their research. In addition, our international students find it a useful repository for current and past news from familiar sources which may be hard to locate when abroad. While much of this information might be found on the open web, ISI’s ease of use and scope make this an essential database for anyone interested in global economics, news, or business. 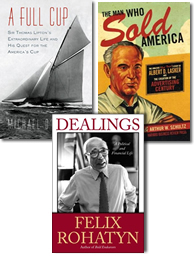 Three engaging new books capture the success and significance of larger-than-life businessmen, Sir Thomas Lipman, Albert Lasker and Felix Rohatyn. D’Antonio, Michael. A full cup : Sir Thomas Lipton’s extraordinary life and his quest for the America’s Cup. Riverhead Books, 2010. A self-made man and millionaire tea baron became the first celebrity CEO through endless self-promotion. In the last half of his life, he allowed his business to erode while he sought fame in yachting. Cruikshank, Jeffrey L. The man who sold America : the amazing (but true!) story of Albert D. Lasker and the creation of the advertising century. Harvard Business Review Press, 2010. A portrait of the man who took the concept “Advertising is salesmanship in print,” and created the most powerful advertising agency in the world, turning brands like Sunkist, Kleenex and Lucky Strike into household names. Rohatyn, Felix G. Dealings : a political and financial life. Simon & Schuster, 2010. A personal account of a Jewish boy who escaped Nazi-occupied France in 1940 and grew up to become CEO of Lazard Freres, which transformed the entertainment industry through M&A. Later in life he saved NYC from bankruptcy and then returned to France as US ambassador. Today (April 20) is the one year anniversary of the BP oil spill in the Gulf of Mexico, the worst oil disaster in American waters in history. The catastrophe began with a series of explosions on the drilling rig, Deepwater Horizon, which killed 11 crew members and caused an massive eruption on the wellhead on the ocean floor. The oil gushed for 10 weeks, releasing 20 times more oil than the Exxon Valdez, killing wildlife and ruining the livelihoods of thousands of people who make their living in and around the Gulf. The two books below provide clear accounts of the disaster, detailing what actually happened and why. BP is one of the largest and most profitable oil companies in the world and promotes its green efforts. Yet corporate policies for cost cutting and for rushing to pump oil led to shortchanged safety features that protect both drilling employees and the environment. Routine maintenance was shoddy and safety improvements were postponed. Federal regulators also share in the blame for not noticing. BP has paid billions of dollars to victims, yet management has admitted nothing that would lead to a reform of corporate culture. This disaster is ripe for repeat. 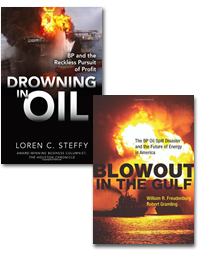 Steffy, Loren C. Drowning in oil : BP and the reckless pursuit of profit. McGraw-Hill, 2011.
Business journalist from the Houston Chronicle provides a clear, thorough and readable account of the disaster, analyzing its roots and implications. Freudenburg, William R. Blowout in the Gulf : the BP oil spill disaster and the future of energy in America. MIT Press, 2011. Two environmental scholars provide insights into BP, industrial risk-taking, and the histories of oil exploration and US energy policy. Turkle, Sherry. 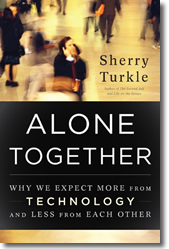 Alone together : why we expect more from technology and less from each other. 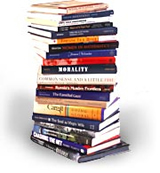 Basic Books, 2011. When Duke’s Bostock Library was dedicated in 2005, the speaker from EDUCOM noted that the current generation of students used technology constantly to communicate. Students with cell phones and email were far more “connected” than students from the past. Yet while walking to the ceremony, I had passed a dozen students talking on their cell phones, and not one made eye contact as they passed by. They were oblivious to everything happening around them, as they gave their attention to someone far away. Now we are in a world of texting, IMing and Facebook messaging through mobile devices 24/7. In a new book Alone Together, a faculty member at MIT says that young people monitor their smartphones constantly, at home, at school and when out with friends. They live in a world of continual partial attention. Instead of a personal and immediate contact of a telephone call, these young people text, making a connection when and where they want, with total control of their message. Texting allows them to keep in touch and keep at bay at the same time, substituting a quick message for connecting with each other face-to-face or voice-to-voice. Explaining how our brains work is a new preoccupation among economists, marketers, investors and professors. 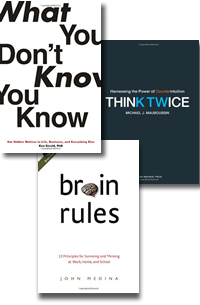 Three new books in the Ford Library help explain why we act as we do, and teach us better ways of thinking and deciding. Mauboussin, Michael J. Think Twice: Harnessing the Power of Counterintuition. Harvard Business Press, 2009. Deciding “from the gut” may work in static environments, but complex dynamic situations require deliberate analysis, where thinking twice often leads to counter-intuitive and better solutions. Medina, John. Brain Rules: 12 Principles for Surviving and Thriving at Work, Home and School. Pear Press, 2008. A molecular biologist explains what scientists know about the workings of the human brain and shows how to improve its performance for ourselves and our daily lives. Also available as an audiobook. Eisold, Ken. What You don’t Know You know: Our Hidden Motives in Life, Business and Everything Else. Other Press, 2009. A practicing psychoanalyst shows how the unconscious mind shapes our thinking and behavior.